Happy Monday. If my life were a book this week was a page turner. It was interesting to say the least. Surprises around every corner. Oh the adventure that is life! As I mentioned last week for the next four weekends I will be volunteering with a non-profit organization called Awaken Arts. I first volunteered with this organization this past fall, and I love it. Besides mentoring the students in an art form, I am also the MC for the programs general sessions. As an MC I weave into the script quotes / thoughts for the students to take with them long after they graduate. This weeks theme is the Present. 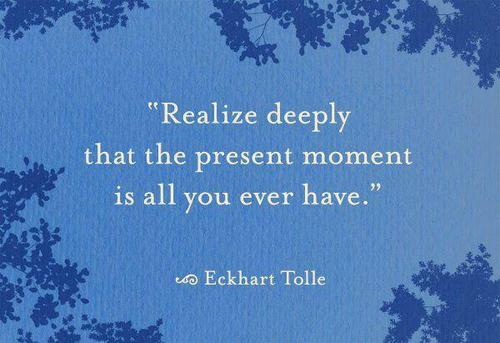 I have been thinking more about the present, since I started reading The Power of Now. The book is all about the present and I love its teaching. Since the theme is on the present, I want us all to think about the present too! If you want to know about the volunteer work I do over the weekend, you can follow me via twitter @steffyflores3. I post program updates throughout the day on Saturday! If you like this post, please like, comment or share it on social media. You can also follow me via Facebook Fan Page IlluminatedVOICE.